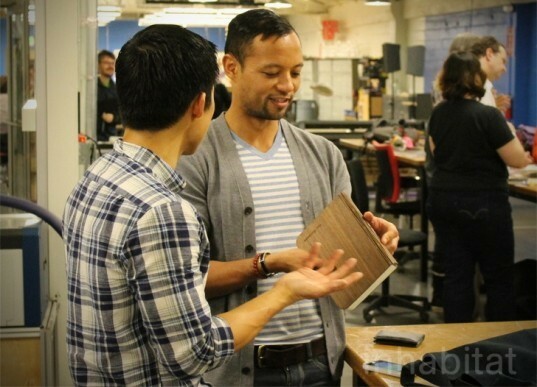 We met up with Max at the Techshop in San Francisco, CA to see the Lumio first hand. 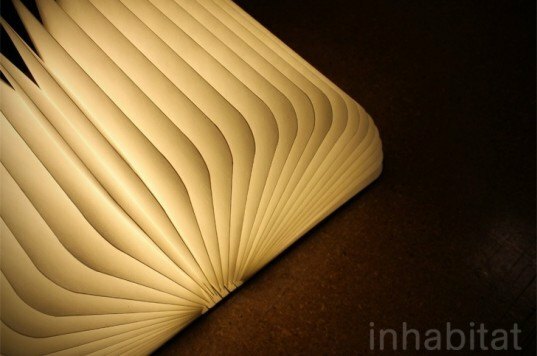 At first glance the lamp looks like a simple hard-bound book or journal, but once you open it, the book unfolds several pages of non-tearable paper that are illuminated by an LED light source. When the book is fully open, the LED light shines so bright that it is able to provide a perfect alternative to a traditional lamp. 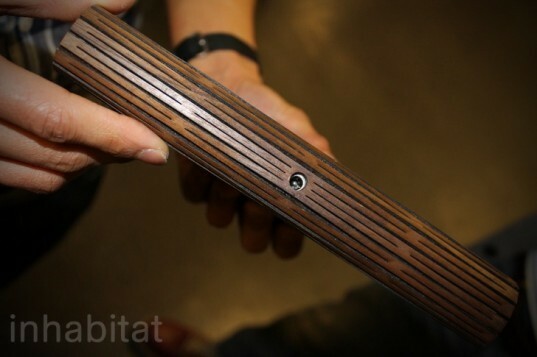 Even better, the hard wood cover is also a magnet, which means that you can attach the lamp to any metal surface. A re-chargeable lithium-ion battery keeps the lamp illuminated for up to eight hours between charges. To kick off production of the Lumio, Max launched a Kickstarter campaign earlier this month and the response has been incredible. Max’s initial goal of $60,000 was met within the first 24 hours, and in less than a week, the campaign topped over $200k. The Lumio lists for $95 and you can choose between three wood finishes: Blonde Maple, Warm Cherry and Dark Walnut. 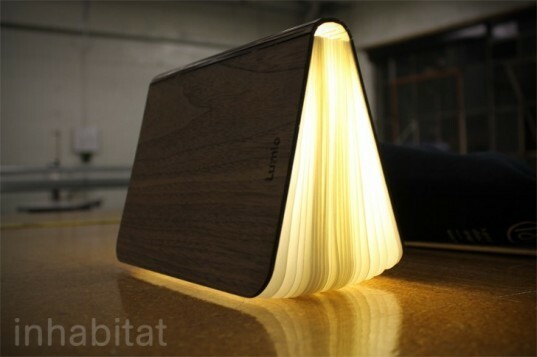 INHABITAT:Where did your inspiration for this lamp come from? Max: I’ve always been fascinated with objects or architecture that can be transformed into multiple shapes and serve multiple functions. I was inspired by this project called the rolling bridge in London by Thomas Heatherwick (designer of the London Olympic cauldron). There’s something so unexpected to see – what appears to be – an urban sculpture unfold into a bridge. At its core, Lumio represents this very same idea but on a much smaller scale: a beautiful object that unexpectedly transforms into a functional device. I was developing a concept for a modular folding home that you can fit into a compact car. Unfortunately, I didn’t have the capital that I need to develop a working prototype for the folding house. Having read “The Lean Startup,” I pivoted the idea into a smaller scale object that people can enjoy. I had these folding paper models that I used to carry around in my Moleskine sketchbook. It dawned on me one day that a book would be a great way to package this idea of a collapsible light fixture: it’s compact, has that visceral connection with the idea of a “book that illuminates” and has that unexpected element of surprise. 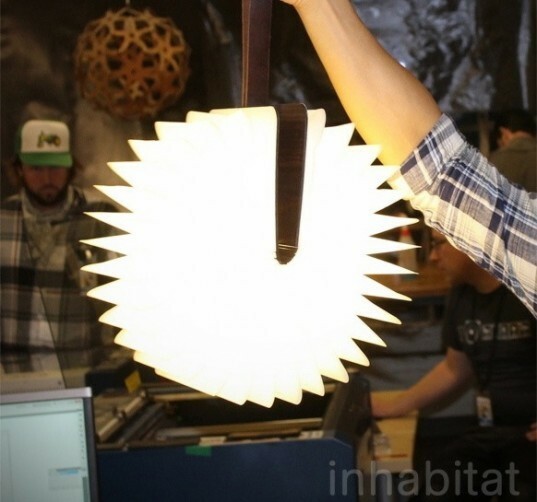 INHABITAT: How long did it take for you to come up with the final Lumio prototype? Were there any limitations? 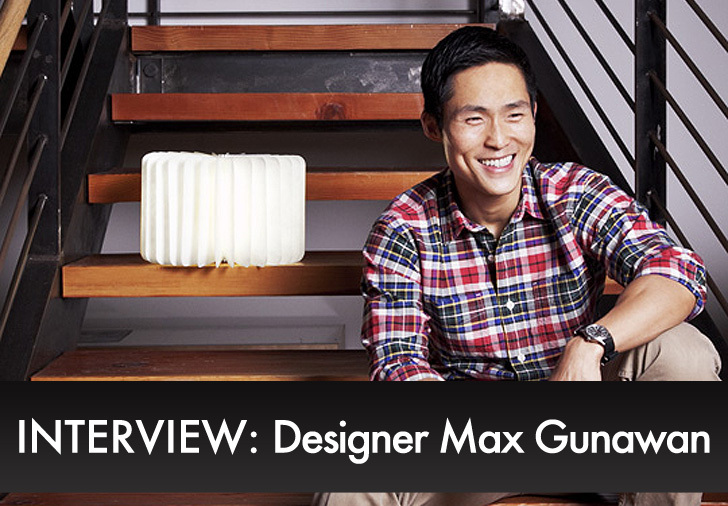 Max: It took about eight months in development before I landed on the “final” prototype. I’m still incorporating new upgrades that will improve the user experience. For example, I recently upgraded the charging system from a standard adapter to a universal USB charger. That’s the great thing about Kickstarter, it provides me direct access to an engaged group of end users. They provide valuable insight on ways to improve the product. The biggest challenge during the design development was translating the concept into a functional device that is simple in design and works intuitively. Simplifying and subtracting unnecessary details tends to be harder than adding more features. INHABITAT:Where are the materials sourced from? Could you see later versions being made of recylable materials? Max: Quality is my priority and I am partnering with suppliers that have a great reputation. Dupont is providing the Tyvek material that makes up the body of the lamp. It is a highly durable material that is 100% recyclable. I want to incorporate environmentally friendly materials like Tyvek and FSC-certified wood from the very beginning and will continue on using sustainable materials moving forward. INHABITAT: With almost 3,000 orders in less than two weeks how will you be able to manage the production and quality assurance? Max: I see scaling up production as an opportunity. It allows me to introduce mechanization that will bring greater precision and consistency to the product. The Tyvek “pages” is the perfect example. 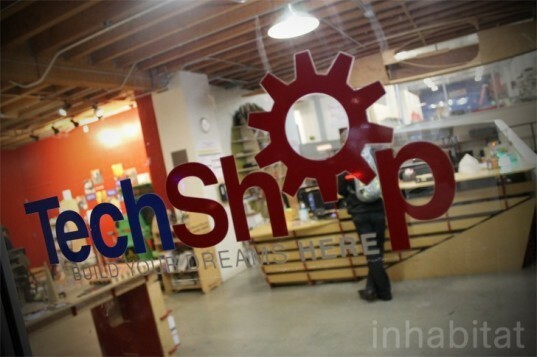 I’ll be using a hi-tech solution to construct this element vs. the hand-crafted approach I’ve been doing at Techshop. INHABITAT:Your initial goal of 60k was surpassed almost immediately. Did you expect it to kick off this fast? Max: I’m very humbled by the attention that Lumio has been getting. I really owe it to my awesome backers and fans! During the planning phase for my Kickstarter campaign, I always told myself to expect the worst but also be prepared for success. I didn’t expect it to blow out this fast but I’m prepared and confident that I can meet the production timeline. 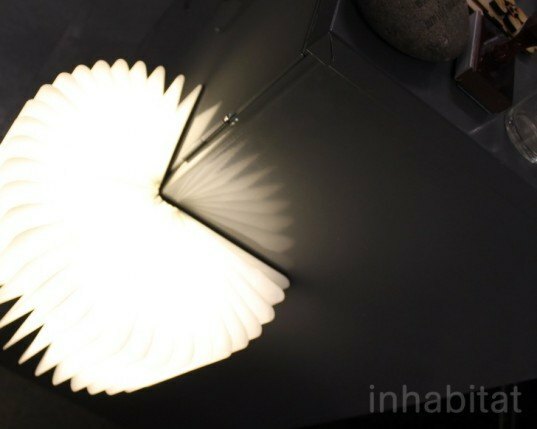 INHABITAT:What’s next for the Lumio? Max: I’d like to expand Lumio in different sizes, cover finishes, use color LEDs and also bring in technology like a solar charging cover or wireless charging that can improve the functionality of the product. I plan to design a line of add-on accessories that will allow consumers to use their Lumio as an interchangeable module as part of a lighting system. I also have an idea for Lumio v.2. that I’m very excited about. More to come on that! INHABITAT: What’s next for you? Are you already coming up with ideas for your next project? Max: Outside Lumio, I want to continue exploring the idea of transforming everyday objects with unexpected uses in other product categories. I’m very passionate about architecture and want to bring in a fresh new take on spatial design and buildings. To kick off production of the Lumio, Max launched a Kickstarter campaign earlier this month and the response has been incredible. Max's initial goal of $60,000 was met within the first 24 hours, and in less than a week, the campaign topped over $200k. To kick off production of the Lumio, Max launched a Kickstarter campaign earlier this month and the response has been incredible. Max's initial goal of $60,000 was met within the first 24 hours, and in less than a week, the campaign topped over $200k. The Lumio lists for $95 and you can choose between three wood finishes: Blonde Maple, Warm Cherry and Dark Walnut. Max: I’ve always been fascinated with objects or architecture that can be transformed into multiple shapes and serve multiple functions. I was inspired by this project called the rolling bridge in London by Thomas Heatherwick (designer of the London Olympic cauldron). There’s something so unexpected to see - what appears to be - an urban sculpture unfold into a bridge. At its core, Lumio represents this very same idea but on a much smaller scale: a beautiful object that unexpectedly transforms into a functional device. I was developing a concept for a modular folding home that you can fit into a compact car. Unfortunately, I didn’t have the capital that I need to develop a working prototype for the folding house. Having read “The Lean Startup,” I pivoted the idea into a smaller scale object that people can enjoy. I had these folding paper models that I used to carry around in my Moleskine sketchbook. It dawned on me one day that a book would be a great way to package this idea of a collapsible light fixture: it's compact, has that visceral connection with the idea of a "book that illuminates" and has that unexpected element of surprise. Max: It took about eight months in development before I landed on the “final” prototype. I’m still incorporating new upgrades that will improve the user experience. For example, I recently upgraded the charging system from a standard adapter to a universal USB charger. That’s the great thing about Kickstarter, it provides me direct access to an engaged group of end users. They provide valuable insight on ways to improve the product. The biggest challenge during the design development was translating the concept into a functional device that is simple in design and works intuitively. Simplifying and subtracting unnecessary details tends to be harder than adding more features. INHABITAT:Your initial goal of 60k was surpassed almost immediately. Did you expect it to kick off this fast? Max: I’m very humbled by the attention that Lumio has been getting. I really owe it to my awesome backers and fans! During the planning phase for my Kickstarter campaign, I always told myself to expect the worst but also be prepared for success. I didn’t expect it to blow out this fast but I’m prepared and confident that I can meet the production timeline. 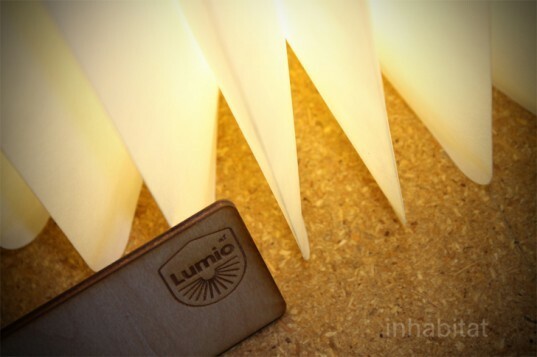 INHABITAT:What's next for the Lumio? Max: I’d like to expand Lumio in different sizes, cover finishes, use color LEDs and also bring in technology like a solar charging cover or wireless charging that can improve the functionality of the product. I plan to design a line of add-on accessories that will allow consumers to use their Lumio as an interchangeable module as part of a lighting system. I also have an idea for Lumio v.2. that I'm very excited about. More to come on that! INHABITAT: What's next for you? Are you already coming up with ideas for your next project? Max: Outside Lumio, I want to continue exploring the idea of transforming everyday objects with unexpected uses in other product categories. I’m very passionate about architecture and want to bring in a fresh new take on spatial design and buildings. INHABITAT: What's next for you? Are you already coming up with ideas for your next project?